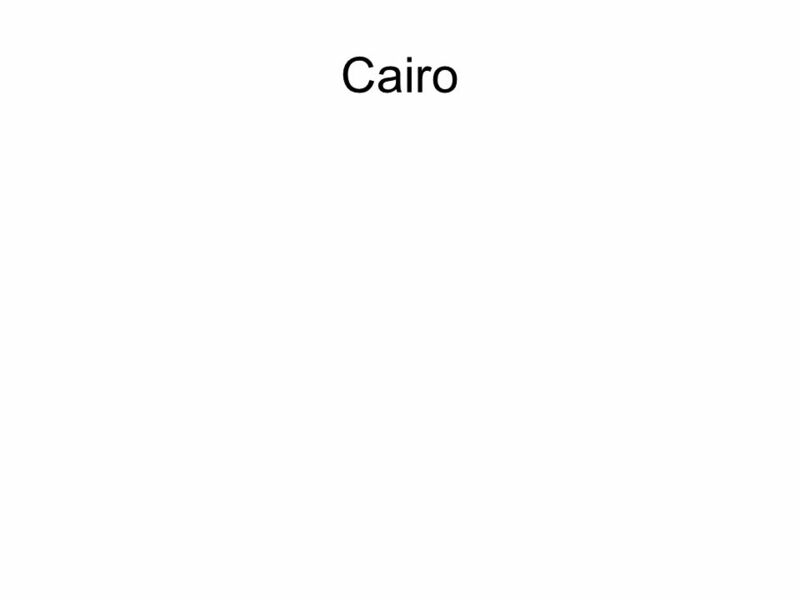 2 5th Largest city in the world. Sao Paulo, Brazil Largest city in Brazil 5th Largest city in the world. 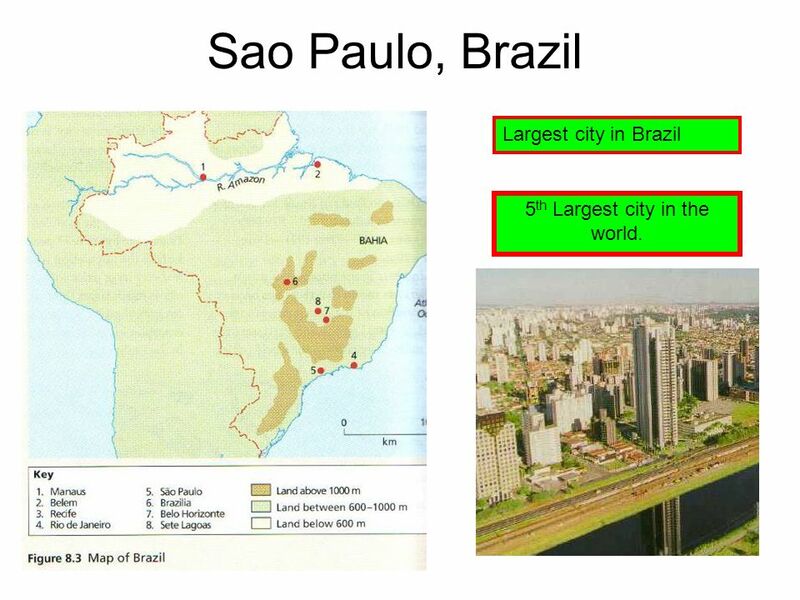 3 G.D.P of Sao Paulo is the same as new south Wales, Australia. 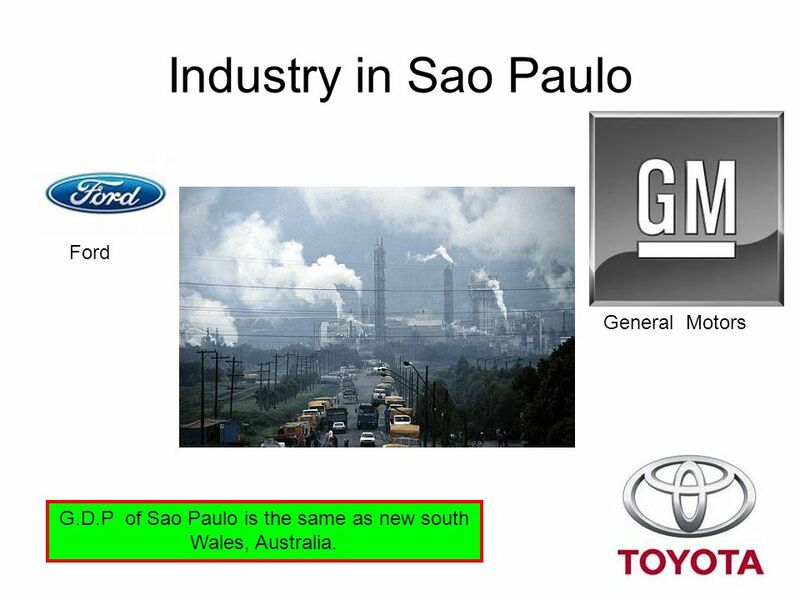 Industry in Sao Paulo General Motors Ford G.D.P of Sao Paulo is the same as new south Wales, Australia. Rapid Urbanisation Infant Mortality is higher in the rural areas 175 per 1,000. In favelas it is 82 per 1,000. Aid is given to grow subsistence rice but little is left after local officials have taken their cut. Overpopulation has led to a shortage of jobs and shelters in rural areas. 31% of rural households have no land. They have to rent land or find work as labourers. Increased Mechanisation has meant that a number of jobs have been lost in the countryside. Housing in the cities will have services near by. In the rural areas they are far from the services. Bahia in Northern Brazil suffers from drought. In this region 32 million people suffer from malnutrition. Push Factors from Rural Areas Land in rural areas has been taken from subsistence farmers by large land owners. 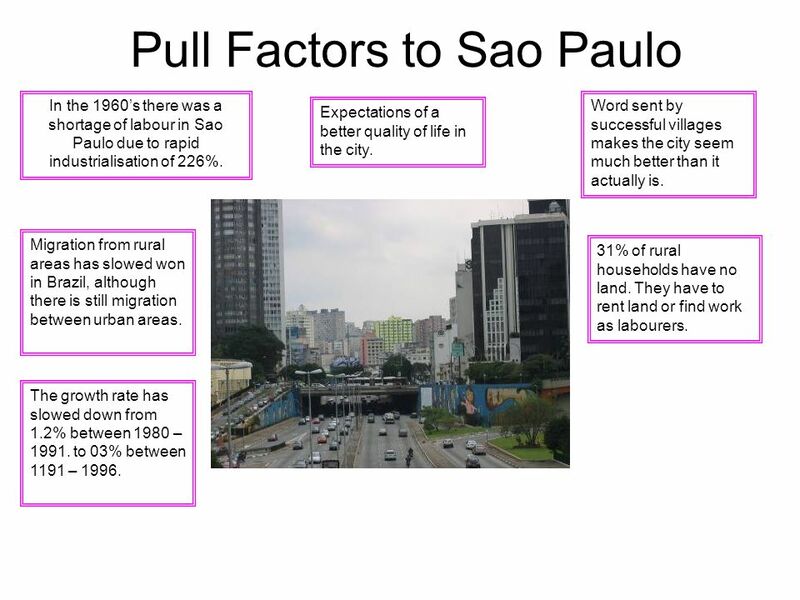 In the 1960’s there was a shortage of labour in Sao Paulo due to rapid industrialisation of 226%. Word sent by successful villages makes the city seem much better than it actually is. Expectations of a better quality of life in the city. 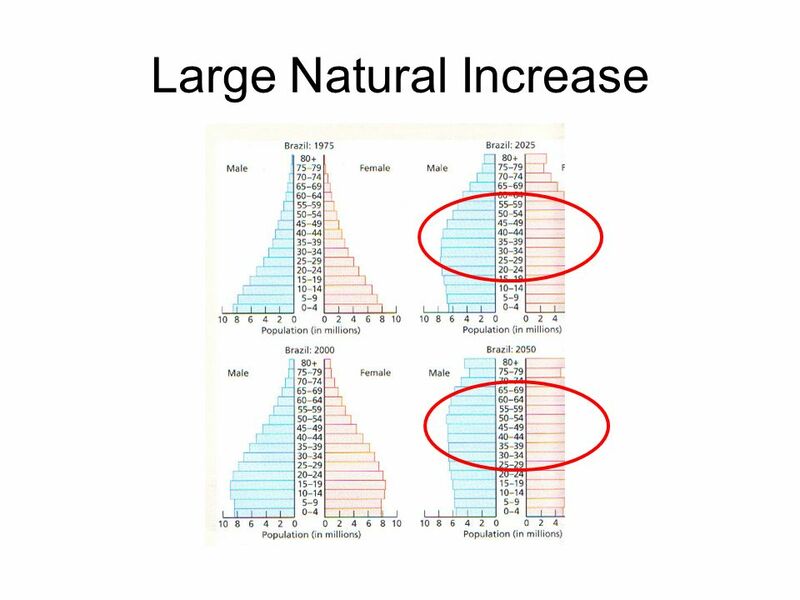 Migration from rural areas has slowed won in Brazil, although there is still migration between urban areas. 31% of rural households have no land. They have to rent land or find work as labourers. The growth rate has slowed down from 1.2% between 1980 – to 03% between 1191 – 1996. The informal sector of Sao Paulo still pays better than the farmers in the countryside. Wages from workers are sometimes sent back to Sao Paulo . This will help the economy there. 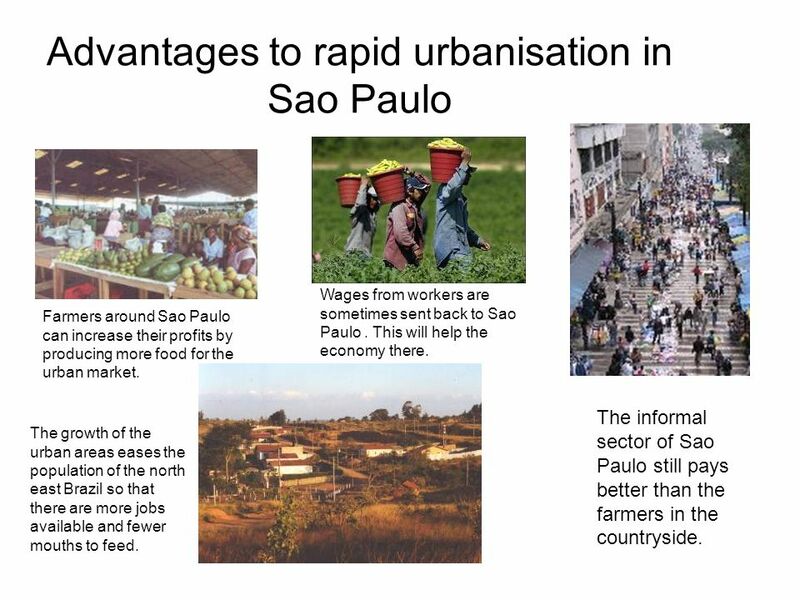 Farmers around Sao Paulo can increase their profits by producing more food for the urban market. 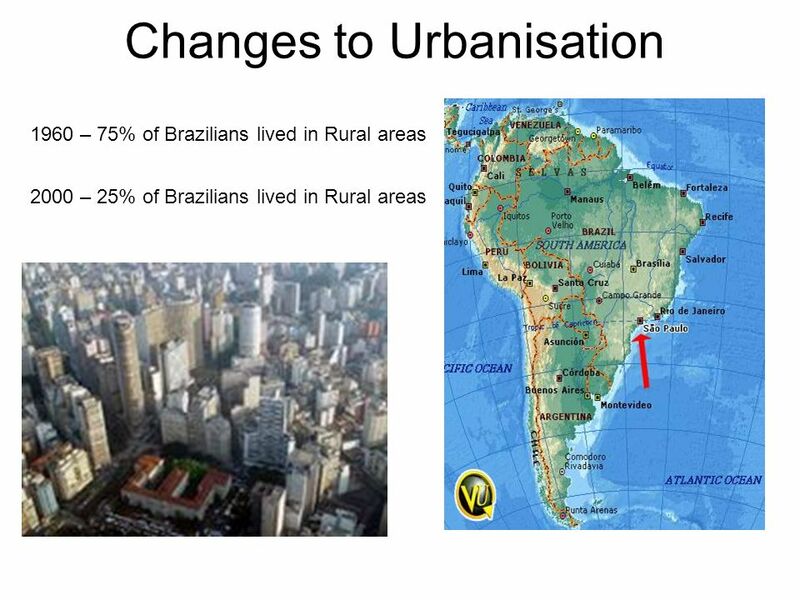 The growth of the urban areas eases the population of the north east Brazil so that there are more jobs available and fewer mouths to feed. 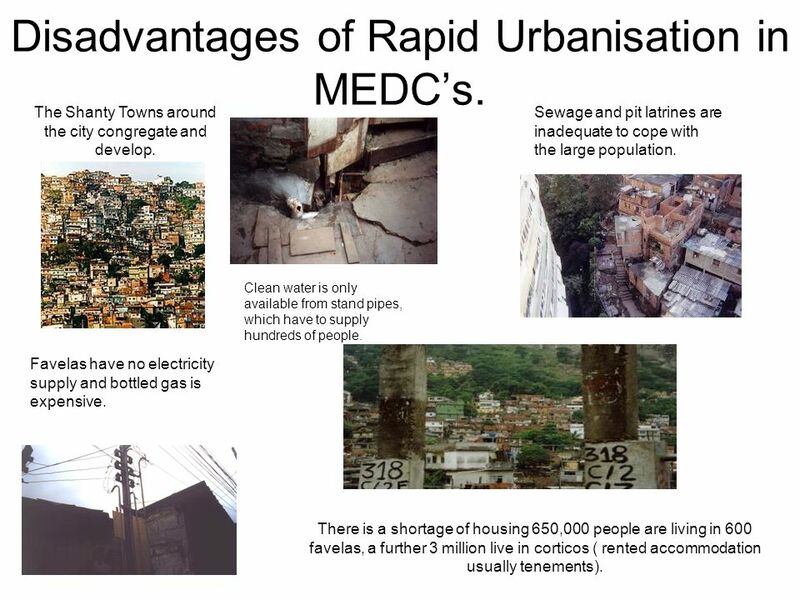 9 Disadvantages of Rapid Urbanisation in MEDC’s. The Shanty Towns around the city congregate and develop. Sewage and pit latrines are inadequate to cope with the large population. Clean water is only available from stand pipes, which have to supply hundreds of people. 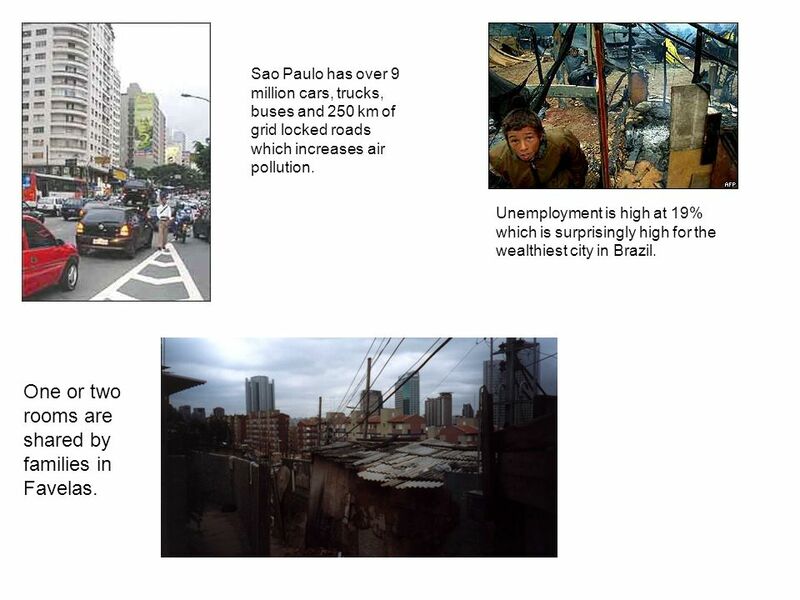 Favelas have no electricity supply and bottled gas is expensive. There is a shortage of housing 650,000 people are living in 600 favelas, a further 3 million live in corticos ( rented accommodation usually tenements). 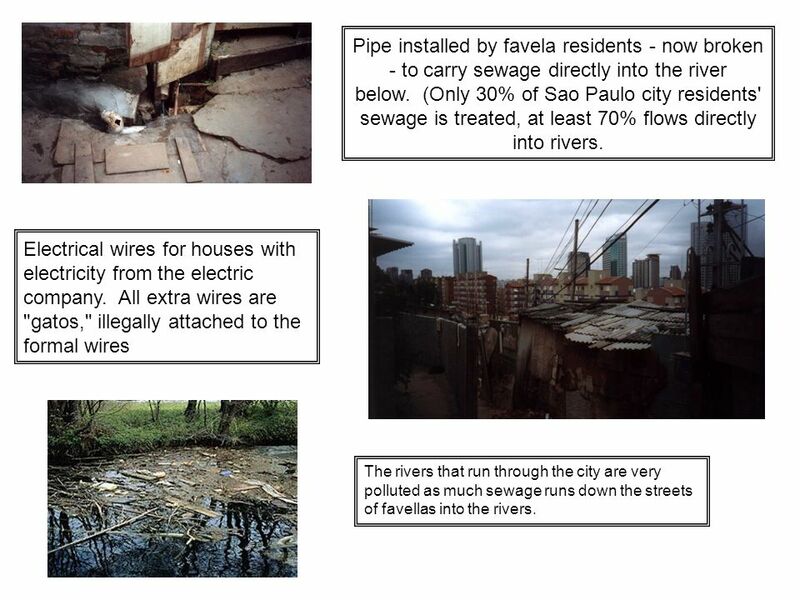 10 Pipe installed by favela residents - now broken - to carry sewage directly into the river below. (Only 30% of Sao Paulo city residents' sewage is treated, at least 70% flows directly into rivers. Electrical wires for houses with electricity from the electric company. All extra wires are "gatos," illegally attached to the formal wires The rivers that run through the city are very polluted as much sewage runs down the streets of favellas into the rivers. 11 One or two rooms are shared by families in Favelas. 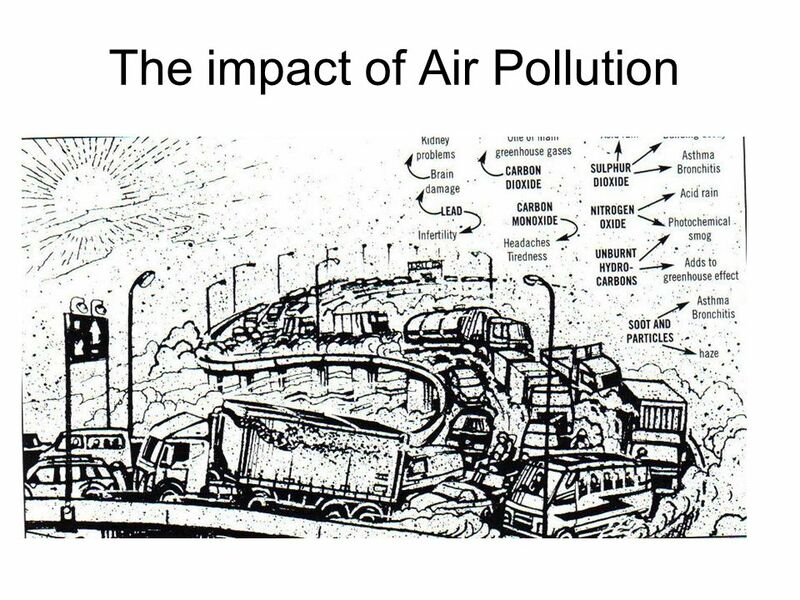 Sao Paulo has over 9 million cars, trucks, buses and 250 km of grid locked roads which increases air pollution. Unemployment is high at 19% which is surprisingly high for the wealthiest city in Brazil. One or two rooms are shared by families in Favelas. 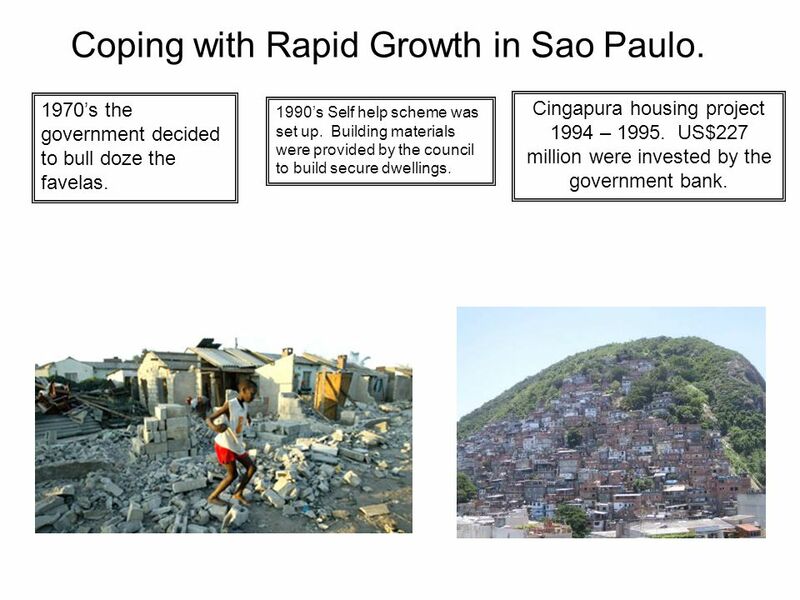 12 Coping with Rapid Growth in Sao Paulo. 1970’s the government decided to bull doze the favelas. 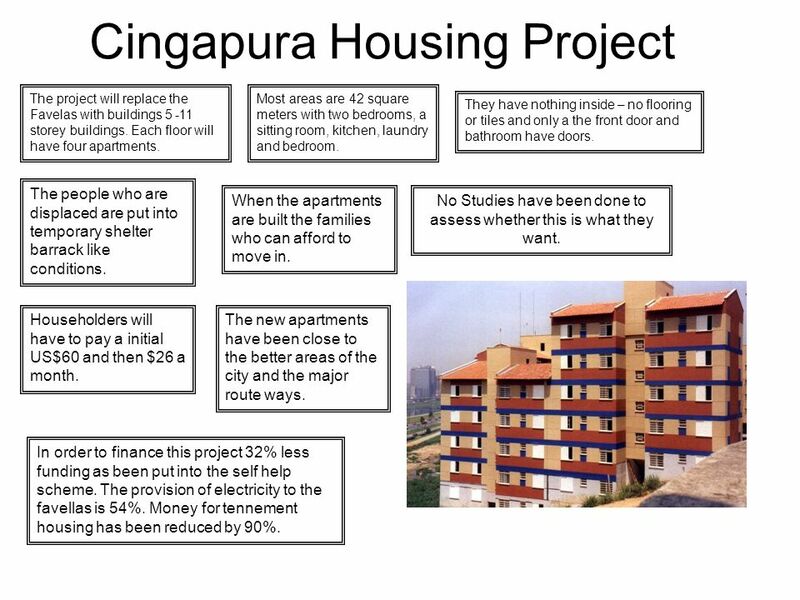 Cingapura housing project 1994 – US$227 million were invested by the government bank. 1990’s Self help scheme was set up. Building materials were provided by the council to build secure dwellings. 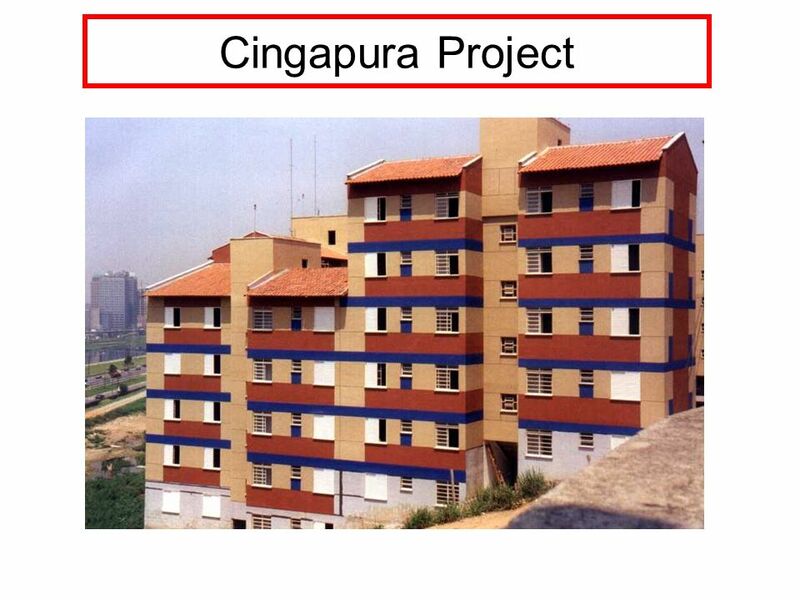 The project will replace the Favelas with buildings storey buildings. Each floor will have four apartments. Most areas are 42 square meters with two bedrooms, a sitting room, kitchen, laundry and bedroom. They have nothing inside – no flooring or tiles and only a the front door and bathroom have doors. The people who are displaced are put into temporary shelter barrack like conditions. When the apartments are built the families who can afford to move in. No Studies have been done to assess whether this is what they want. Householders will have to pay a initial US$60 and then $26 a month. The new apartments have been close to the better areas of the city and the major route ways. In order to finance this project 32% less funding as been put into the self help scheme. 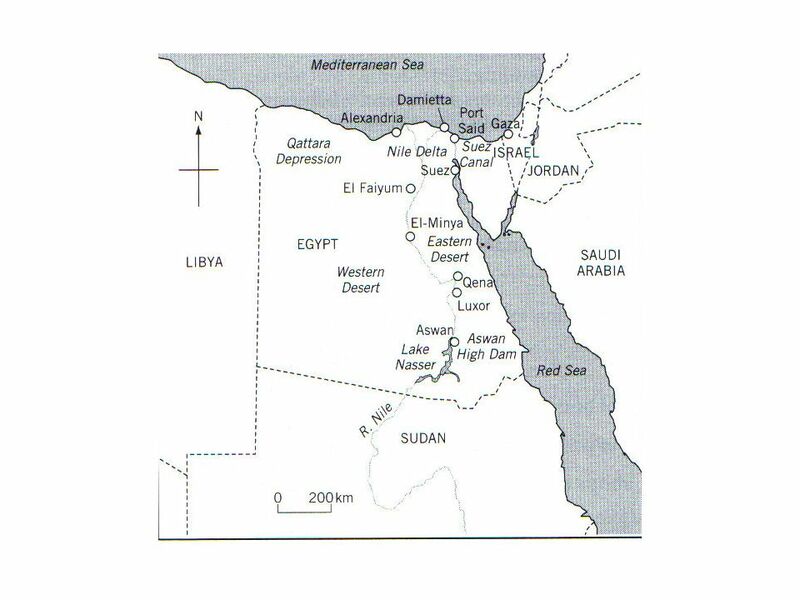 The provision of electricity to the favellas is 54%. Money for tennement housing has been reduced by 90%. 16 The new apartments were too much of a change of environment. 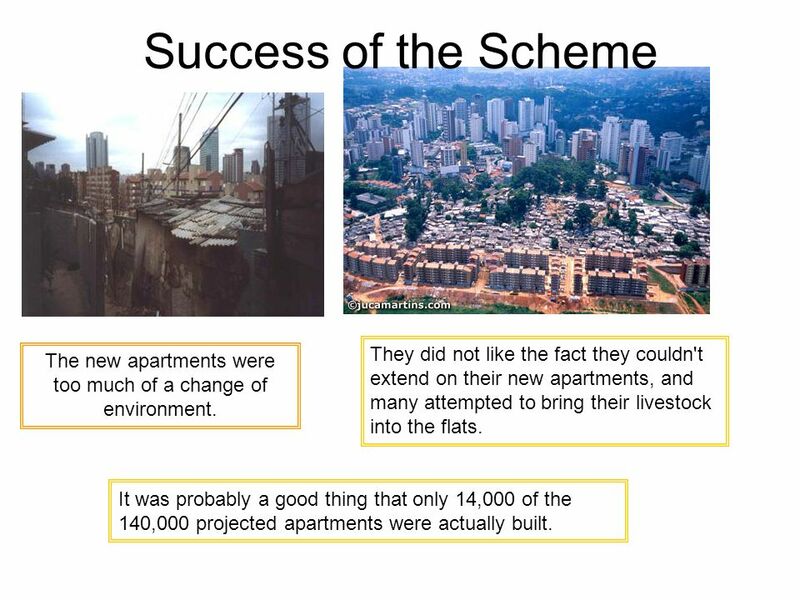 Success of the Scheme They did not like the fact they couldn't extend on their new apartments, and many attempted to bring their livestock into the flats. The new apartments were too much of a change of environment. It was probably a good thing that only 14,000 of the 140,000 projected apartments were actually built. 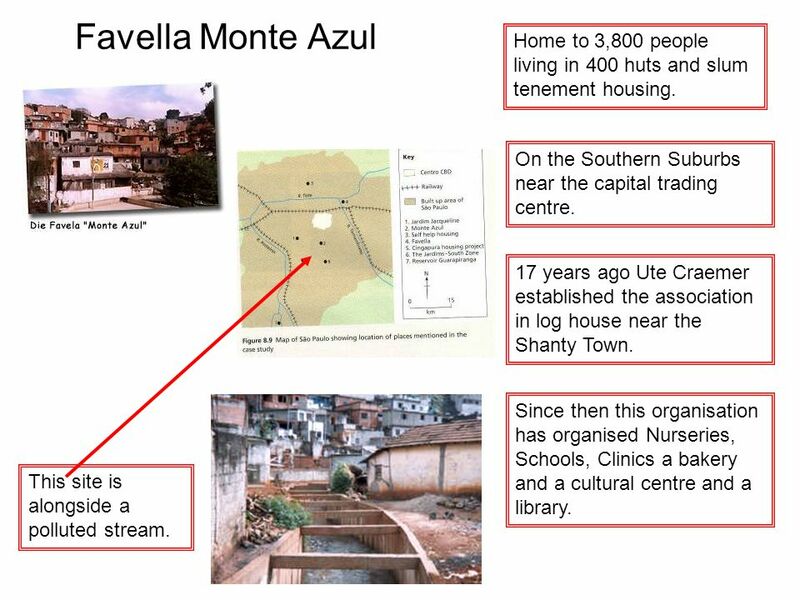 17 Favella Monte Azul Home to 3,800 people living in 400 huts and slum tenement housing. On the Southern Suburbs near the capital trading centre. 17 years ago Ute Craemer established the association in log house near the Shanty Town. Since then this organisation has organised Nurseries, Schools, Clinics a bakery and a cultural centre and a library. This site is alongside a polluted stream. 18 Industrial Estates 3 factories are in operation, a printing works, an industrial solvents company and a clothing factory. They have been set up one on a 37ha site which was developed due to multitude of share holders. 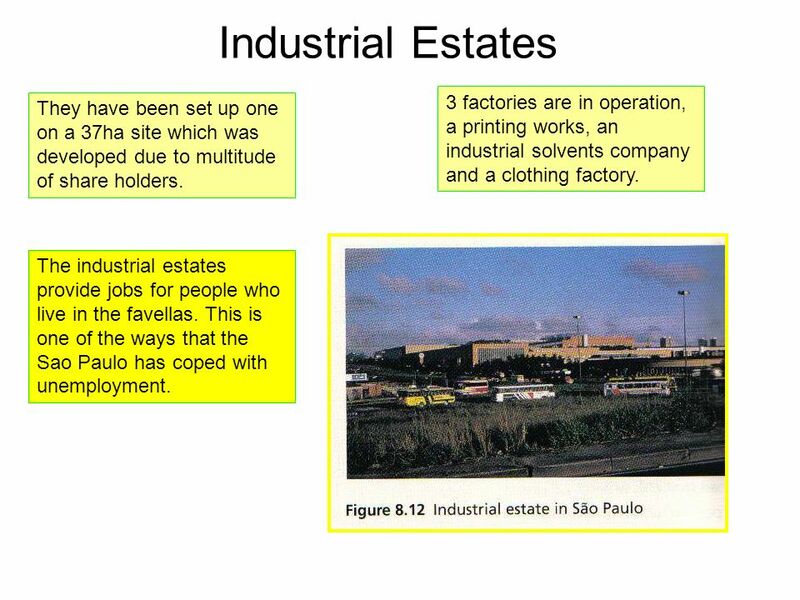 The industrial estates provide jobs for people who live in the favellas. This is one of the ways that the Sao Paulo has coped with unemployment. 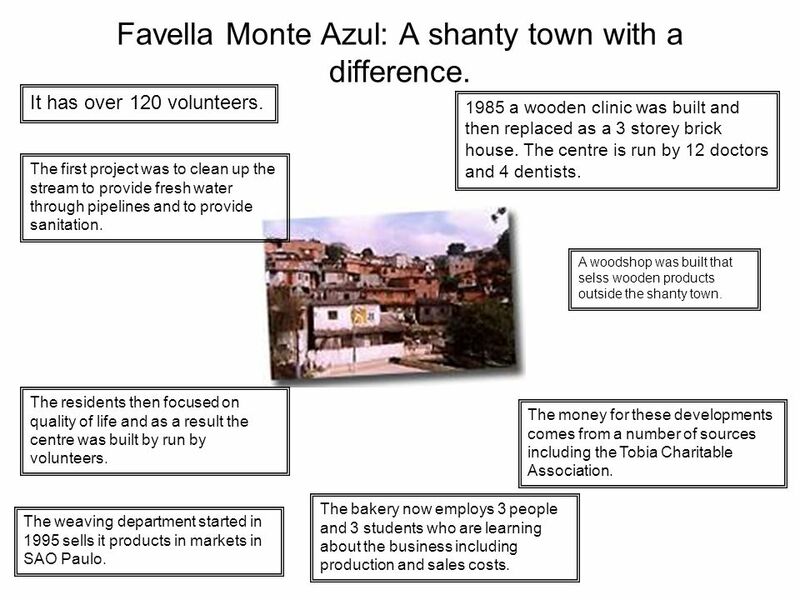 19 Favella Monte Azul: A shanty town with a difference. It has over 120 volunteers. 1985 a wooden clinic was built and then replaced as a 3 storey brick house. The centre is run by 12 doctors and 4 dentists. The first project was to clean up the stream to provide fresh water through pipelines and to provide sanitation. A woodshop was built that selss wooden products outside the shanty town. The residents then focused on quality of life and as a result the centre was built by run by volunteers. The money for these developments comes from a number of sources including the Tobia Charitable Association. The bakery now employs 3 people and 3 students who are learning about the business including production and sales costs. The weaving department started in 1995 sells it products in markets in SAO Paulo. 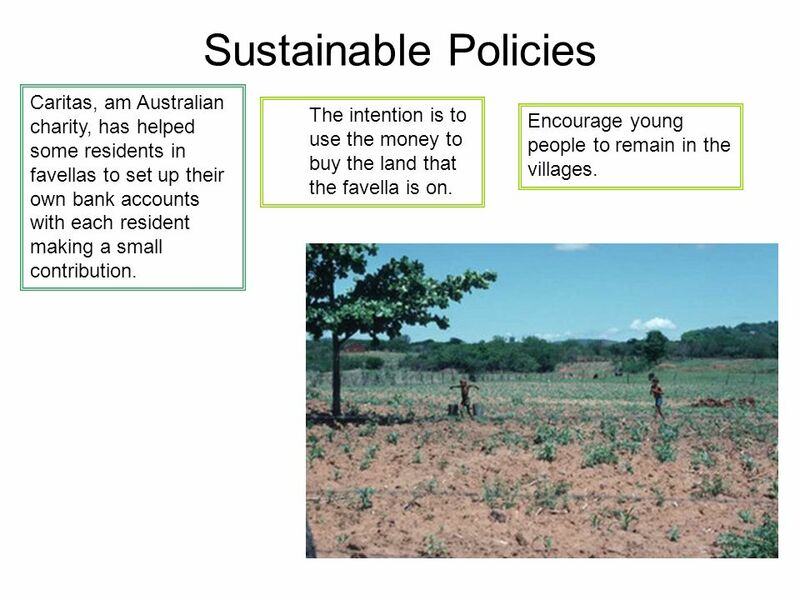 20 Sustainable Policies Caritas, am Australian charity, has helped some residents in favellas to set up their own bank accounts with each resident making a small contribution. The intention is to use the money to buy the land that the favella is on. Encourage young people to remain in the villages. 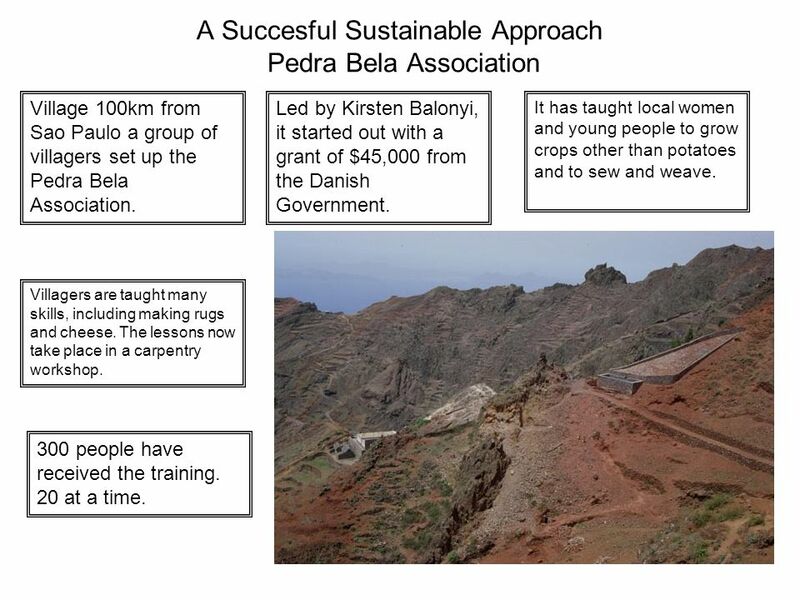 Village 100km from Sao Paulo a group of villagers set up the Pedra Bela Association. Led by Kirsten Balonyi, it started out with a grant of $45,000 from the Danish Government. It has taught local women and young people to grow crops other than potatoes and to sew and weave. Villagers are taught many skills, including making rugs and cheese. The lessons now take place in a carpentry workshop. Their crafts are sold in Sao Paulo once a month and several shops in the city now sell it without comission. 300 people have received the training. 20 at a time. 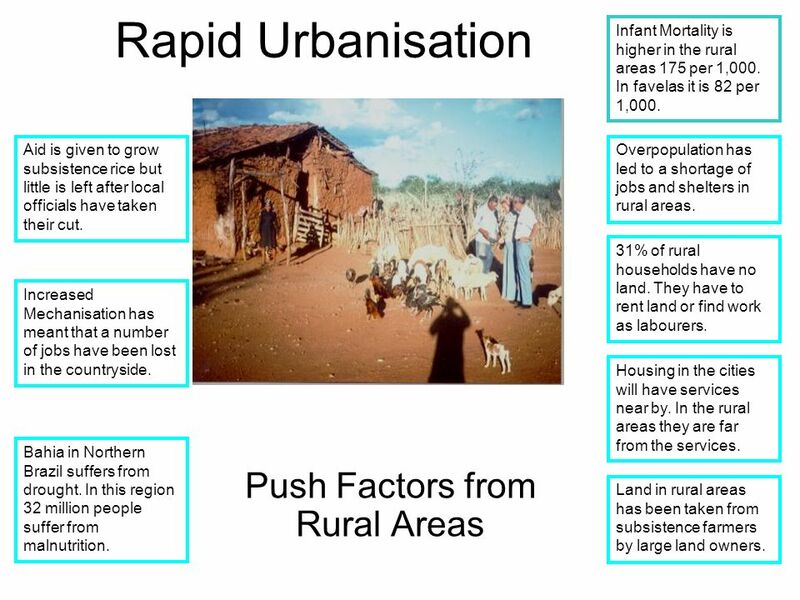 3B: what are the problems associated with rapid urbanisation? 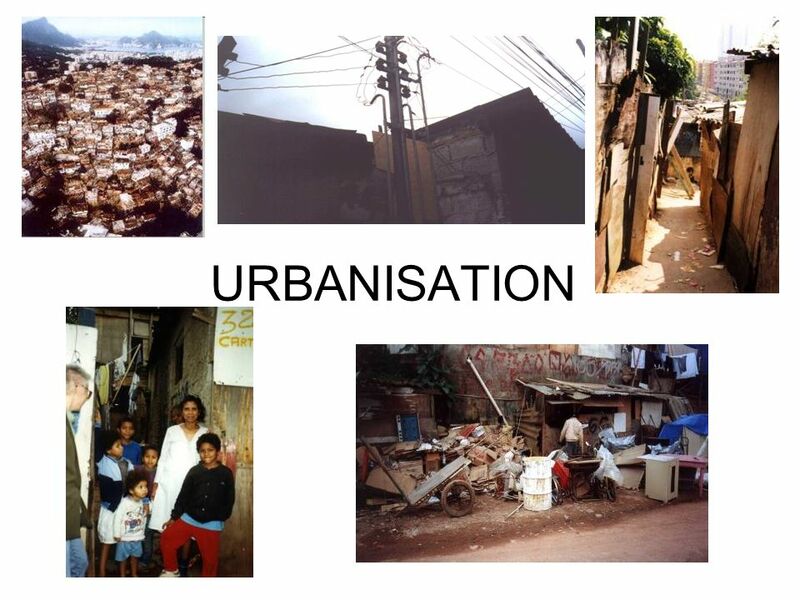 1.4 Demographic Change Is urbanisation a solution or a problem for improving sanitation? 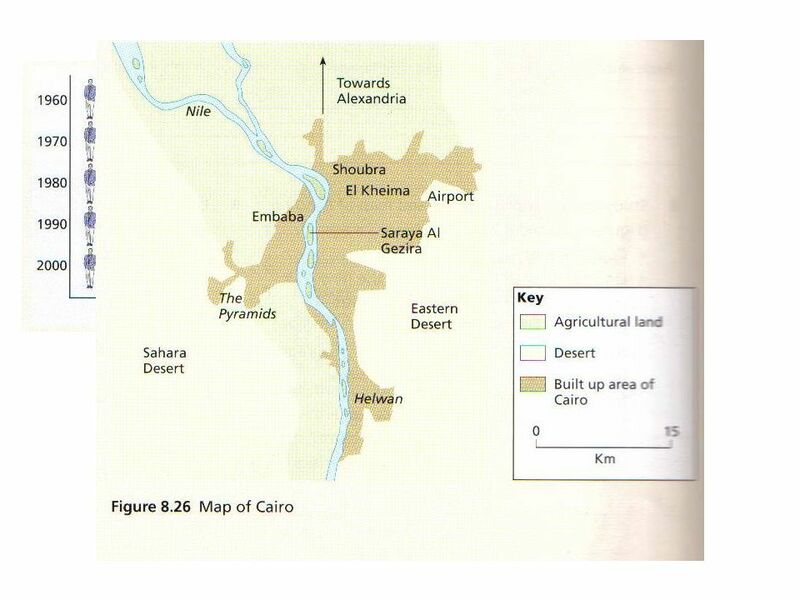 Learning objectives: to gain insights about the role of demography. Alan Doherty Linlithgow Academy ( photos ) Malcolm McDonald Bathgate Academy. A look at how Habitat for Humanity is helping the poverty housing here in Macon By: Hannah Pelt. The Global Village The world is a crowded place. As of today the world’s population is 6,600,000, countries have more that 50 million people. 11. The Impact Of Multi-National Companies. 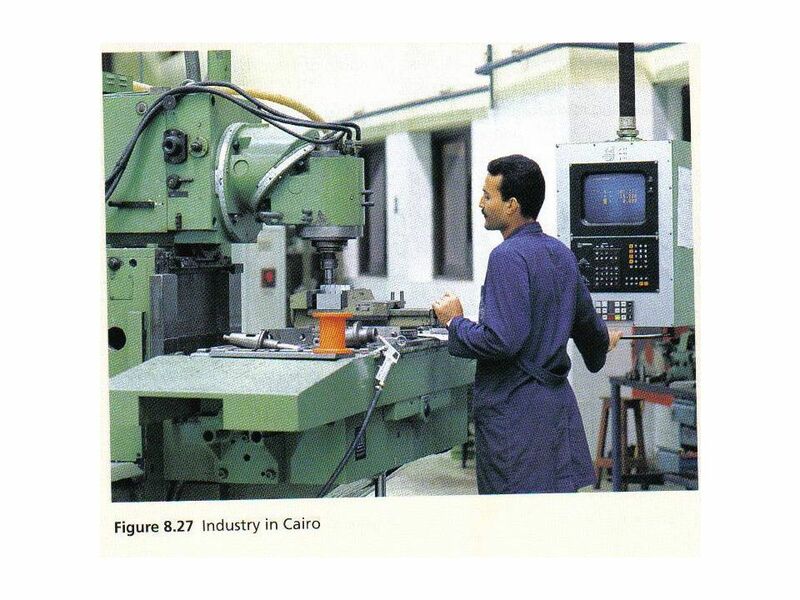 Multinational/Transnational Multi-national or Trans-national companies are ones which locate their factories throughout. 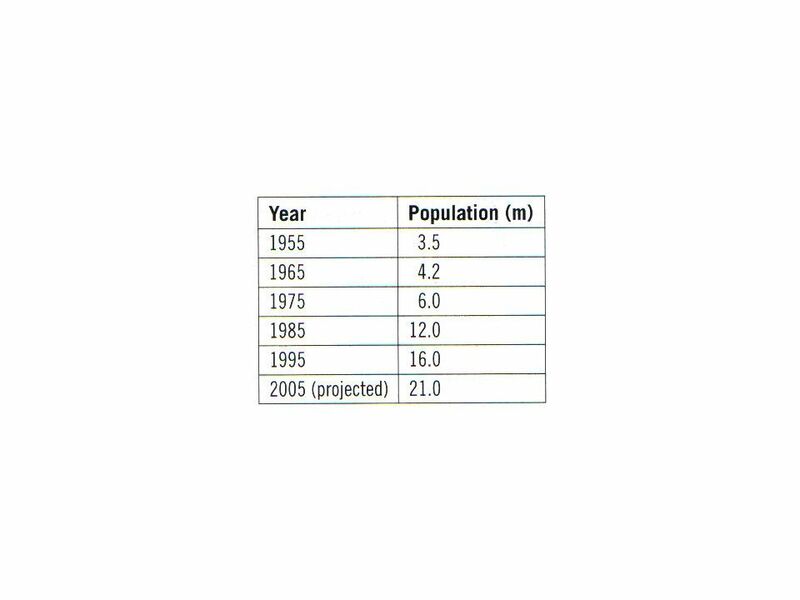 Urbanisation in LEDCS. 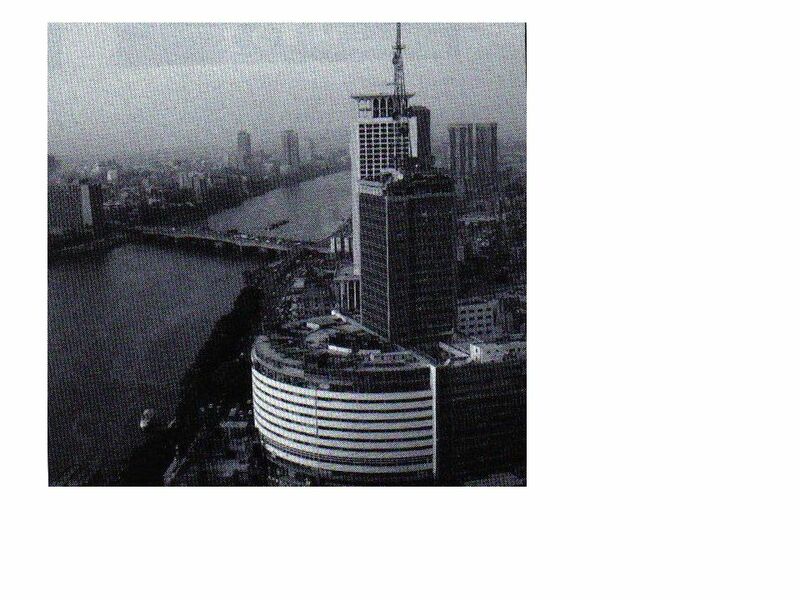 Urbanisation Is the expansion of towns and cities – where an increasing proportion of people lives in cities. Chinese One Child Policy Facts  The Chinese one child policy which was introduced by the Chinese government as a measure to reduce the country's birth. Should she stay or go? Using the statements sort them into reasons she should stay and reasons she should go For both sets arrange them in your book in. Using your m62 template The Industrial Revolution.